You don’t have to travel far from Old Naples to discover another charming Naples neighborhood known as Coquina Sands. Often locals mention Coquina Sands and The Moorings in the same breath as the two communities flow rather seamlessly into one another. One way you can distinguish your location is by the street names. 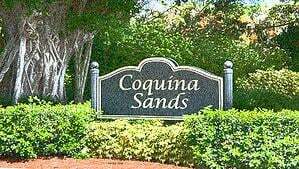 Most of the streets in Coquina Sands take their names from local trees, plants, or common seashells of Southwest Florida. So if you find yourself on Banyan Boulevard Ixora Drive, or Coral Drive, you’re in Coquina Sands, while driving (or walking) down nautical sounding streets such as Bow Line Drive, Rudder Road or Leeward Lane would place you in The Moorings. The neighborhood is in a great location, between US 41 and the Gulf of Mexico and offers canals and Gulf access waterways. Park Shore marks the northern boundary and the Naples Beach Hotel Golf Course forms the boundary on the south. Coquina Sands residents can take advantage of beautiful Lowdermilk Park (owned by the City of Naples). This family-oriented beach park includes a volleyball court, a gazebo, restrooms, food concession and showers. Quite a number of modest homes—built for the most part in the late sixties and early seventies—dot the neighborhood. A large number of the waterfront properties have direct access to the Gulf of Mexico without having to contend with bridges—a great plus for residents with sailboats. Home prices in the area vary greatly (between $125,000 to about $5,000,000) depending on size and location. That’s not surprising given that you can find everything from a 900 square foot bungalow on the bay to a 5000 square foot penthouse condo with gorgeous Gulf views—and just about everything in between. Click here for a look at a Coquina Sands kitchen we recently remodeled. Coquina Sands residents also have great shopping right at hand at the Naples Shopping Center and Moorings Plaza. These conveniently located shopping areas are within walking distance of many of the homes and include Publix, Marshalls, Office Depot, restaurants, a bank, as well as a beauty shop and barbershop. Coastland Center Mall, and Gateway Plaza are also nearby and offer chain restaurants as well as small mom and pop establishments, an organic grocery, and a bookstore. There are plenty of additional activities in the area as well. One of the most popular Naples landmarks, the Naples Beach Hotel and Golf Course, is right on the beach, providing residents the opportunity to enjoy “Jazz on the Green” in the summer months. And by the way, areavibes.com gives Coquina Sands great marks for livability in the areas of: Amenities (A+), Employment (A+), Housing (A+), Crime (A+), Weather (A), and Education (B+).